The concept of TSR® originates from the works carried out by REVES, the European Network of Cities and Regions for the Social Economy. Since its creation, in 1996, REVES has been working at local level on the development of participative democracy and cooperation against a competitive vision of the territory. Its fight for social inclusion, cohesion and quality of life as well as for a more responsible approach for social enterprises brought REVES to the definition of “territorial social responsibility” TSR®. 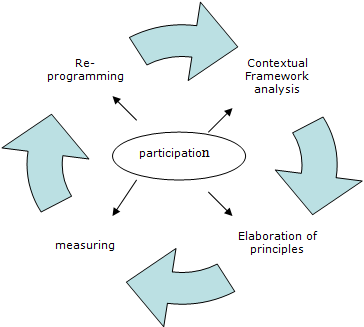 From 2002 onwards, REVES has developed a methodology for local democracy that conjugates the operational logics of representative systems with the need for community participation, aiming to promote and support processes of changing. These efforts led to the present publication. REVES involves local authorities and social economy enterprises in research and conception of new methods for local planning, the development of local welfare systems based on good governance, participation and, in particular, building up the sense of a widened social responsibility. TSR® is a methodology for local planning that integrates social, economic, cultural and environmental dimensions. It is based on a process of participatory governance, which aims for improvement of quality for a whole community on a given territory, through greater social cohesion, sustainable development, economic efficiency and wider democracy. The stakeholders of TSR are local authorities, social economy and other enterprises, civil society and citizens, implicated in an interacting system. TSR® responds to the needs of local communities, where by this term we mean all the representatives, organised and non-organised groups and stakeholders on a given territory, by seeking to adapt current policies and behaviours in order to improve local quality. d) efficacy. The TSR® process leads to an improvement in the quality of life of all actors within a territory. The present guidelines are in continuity with pre-existing instruments ( Local Agenda 21, the Global Compact, social accounting, CSR? ). It is important to underline the fact that the key distinctive features of the TSR® process are its territoriality, its capacity to integrate all aspects and actors of a territory, the participatory and self-determining dynamic of the community of a territory within the boundaries of international rules, and finally, its measurability and therefore comparability. The TSR® methodology aims to encourage a process of progress supported and realised by all stakeholders of a given territory. d) reprogramming policies and planning. A key instrument here in is the participation of the whole community. You will find all REVES publications on TSR® under ‘Publications‘.